Pain is usually a helpful sign that something is wrong with a part of your body. Heat-pain will cause you to pull your hand back from something hot before it burns you. The pain of a cut will draw your attention to it, so you can clean it. However damage to the central or peripheral nervous system can result in chronic neuropathic pain, which is not helpful form of pain. Neuropathic pain is basically some mis-firing or mis-connected pain neurons sending meaningless, but persistant pain signals to the brain. 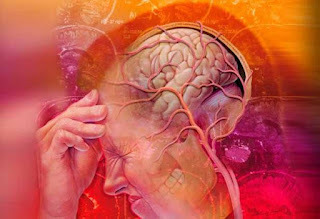 And as bad as that sounds, chronic pain can also apparantly wreak havoc on your brain. A recent study by Mutso et al., (2012) shows that in both humans and experimental animals, the brain is actually re-organized in response to chronic pain. Specifically, they look at pain-related changes in the hippocampus, the part of the brain most strongly implicated in memory encoding. They compared human patients with chronic back pain, complex regional pain syndrome, and osteoarthritis to people with no pain-related condition, and found that the people with both chronic back pain and with complex regional pain syndrome both had reduced hippocampal volume when compared with the normal control group. The osteoarthritis patients showed a trend toward reduced hippocampal volume, but the result was not statistically significant. So what does this mean? 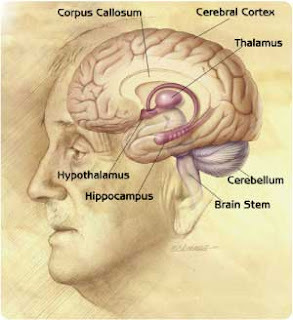 If you have chronic pain you have a smaller hippocampus? We've covered this kind of study before, basketball players had larger striatums that non-basketball players, but it is never really clear what the volume of a brain region tells us. Does the volume of a brain structure mean more neurons, more blood flow to that region, more glia cells, or differently shaped neurons? It is very difficult to draw any conclusions about the effect of pain on the hippocampus simply by learning that the hippocampi of people with chronic pain are smaller than the hippocampi of normal people. Luckily the study did not end there. Mutso et al. also investigated the effects of chronic pain on the cellular level. They found that in mice with chronic pain, the hippocampus has fewer 'new' cells. By staining for two specific markers DCX and BrdU, you can tell which neurons are new. 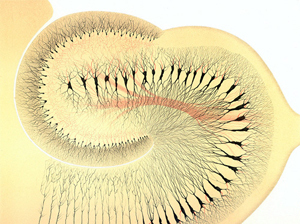 The hippocampi of control (normal) mice had around 40 new cells, while the chronic pain mice had only 14. This is an indication that neurogenesis is much reduced in response to chronic pain, and suggests that the reduction in hippocampal volume could be related to fewer new neurons being generated (though it does not show this conclusively). Unfortunately, chronic pain is bad for your hippocampus, and a cure for both the pain and the collateral brain re-organization are still illusive. I feel chronic tension in back part of head, and I suffer from depression. If the control group didn't differ significantly from the pain groups, could it be that chronic pain is just a by-product of something else which results in a smaller hippocampus? Was age controlled in the study? Good question. I would certainly hope that age was controlled for, but I'd have to go back and check to make sure. Do small men think like big women?